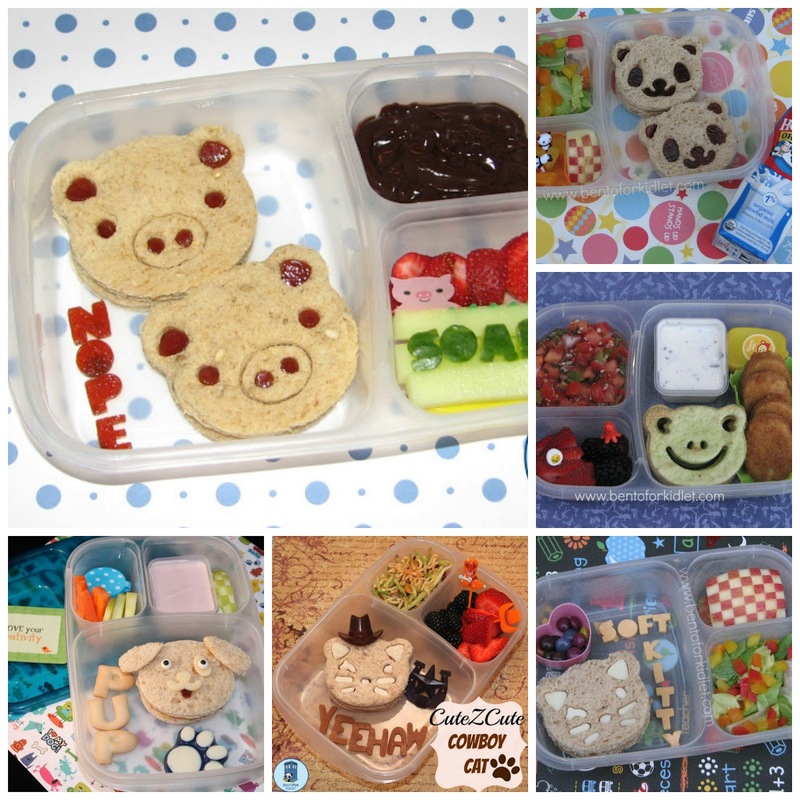 Bento for Kidlet: CuteZCute All Day Long! If you've been following this blog for any amount of time you may have seen a lot of lunches made using the CuteZCute Food Deco Cutter Kit! We absolutely adore it! If you're not familiar with the product, it's an all-in-one bento tool kit that creates easy and adorable foods. Whether you are a bento pro or a beginner this tool is absolutely for you! One set includes everything you need to create an endless number of adorable foods! The Panda Assistant Pick that is included pops out the small face pieces easily. Easy and safe for children to use! With no sharp edges, children can help! And despite no sharp edges the CuteZCute still cuts through food easily! And now, please join us for a day full of CuteZCute! We used our CuteZCute cutter to make these simple and delicious donuts with an orange-almond glaze! 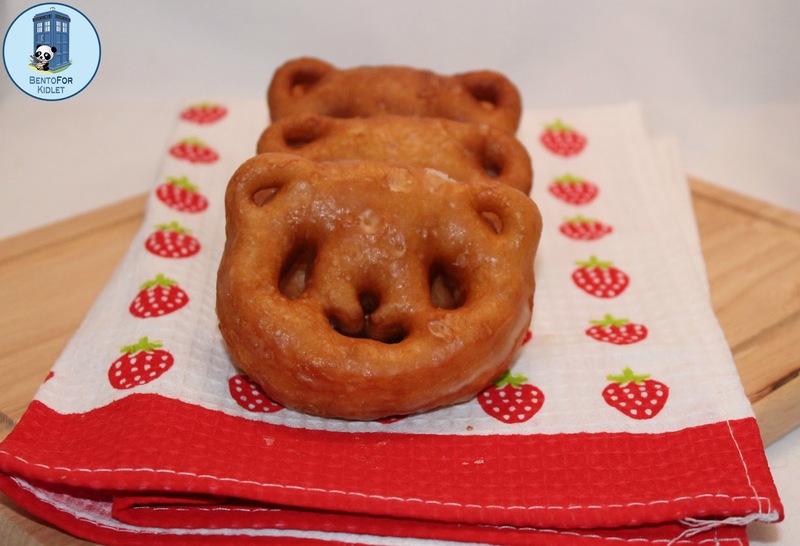 Using the CuteZCute, cut out biscuit dough. Fry in hot oil flipping once until lighly browned. Mix all ingredients together until you have achieved a thick but still slightly runny glaze. Pour over food for deliciousness! CuteZCute has two sides to every face plate. One cuts through foods to leave a blank space for the facial features. 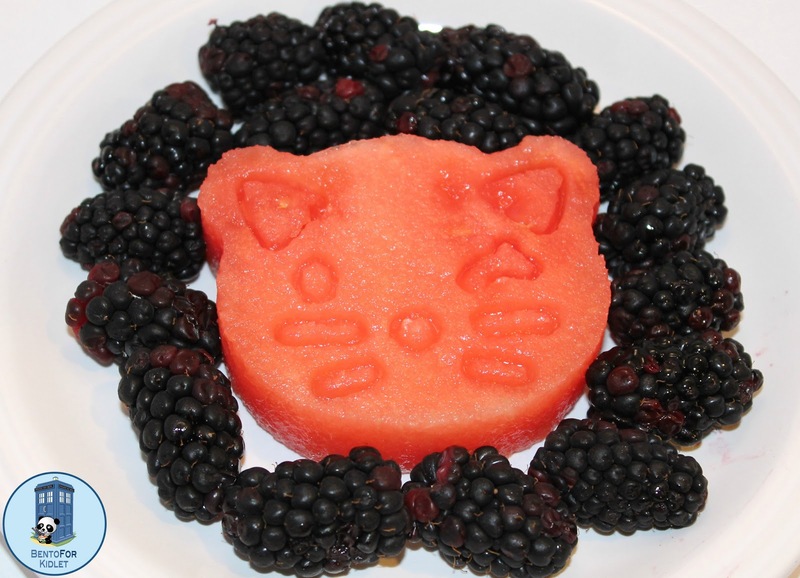 The other side is an imprint of the face that we used above for this adorable watermelon face! Perfect for a fun breakfast or even for potlucks and events! We have used our CuteZCute for many fun school lunches! Simple sandwiches are made adorable quickly and easily! Homemade tortilla chips are made by cutting out tortilla shapes with the CuteZCute, brush with olive oil and sprinkle with a bit of salt. Then bake in the oven until crisp! Yum! 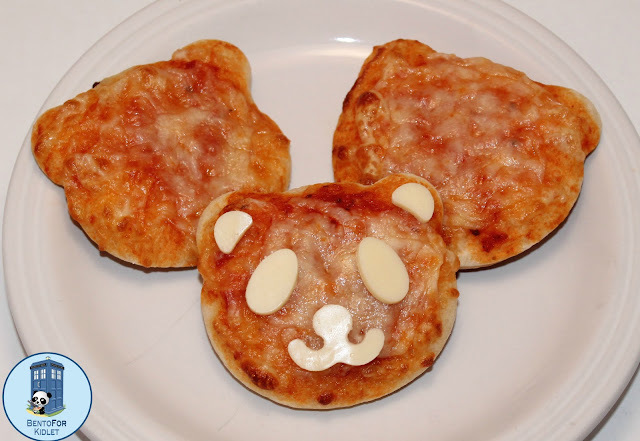 Mini Pizzas are a fun and easy dinner option. We used refrigerated pizza dough, spread with tomato sauce, sprinkle on some cheese and bake as directed on your package. Add cheese facial features at the end! 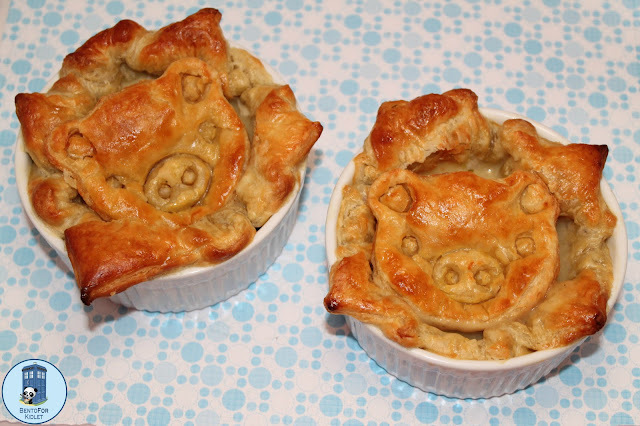 Cute Little Piggie Pot Pies are warm and delicious at dinner time! Using store bought puff pastry dough, I lined small ramekins with dough and baked until puffy and golden. I then baked some pig shaped faces until golden brown. Fill the ramekin with chicken pot pie filling (or any kind of filling you like!) and top with a puff pastry piggie! 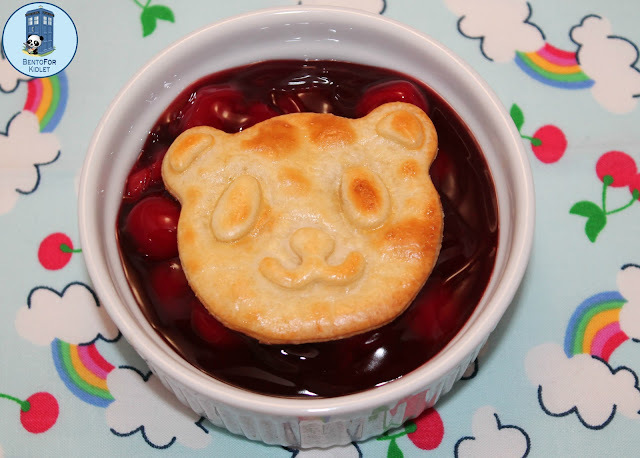 Cherry Pie filling and pie crust cut out and stamped with the CuteZCute makes an adorable and delicious dessert! Serve warm with ice cream! Yum! I hope you enjoyed our day full of delicious CuteZCute ideas! It really is an amazing and versatile tool! Your post is so CUTE! Wow!!! you are soooooo good! Everything in this post is wonderful torture...I want it all...NOW. Wow! I love the donuts! Everything is very cute!! Awesome review! Brilliant review! Wish I'd gotten around to reading it before baking pies for dinner, yours are so much cuter! Wow, so many fantastic ideas, u rock! You are incredible!! I love everything you've made with the Cutezcute! And those donuts look amazing! !